Simply upload a photo or video of you polishing the Mitsubishi badge on the front of your vehicle (just like in our TV commercials!) for your chance to win a VIP World Tour. WANT TO KNOW MORE ABOUT THE COMPETITION? 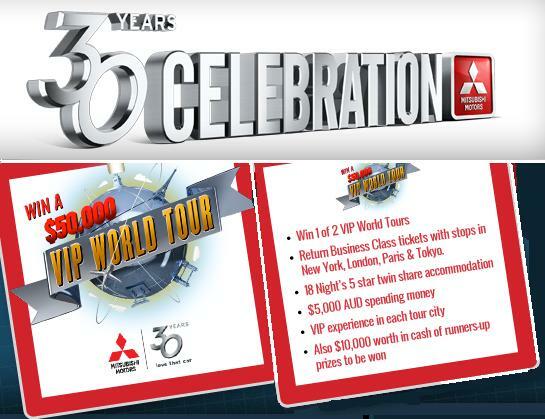 To celebrate 30 years in Australia Mitsubishi owners can win 1 of 2 VIP World Tours valued at over $50,000 each. To showcase the ‘love that car’ sentiment that is felt around Australia, we want you as a current Mitsubishi owner – brand new or second hand – to upload a photo or video of you polishing the Mitsubishi badge on the front of your vehicle (just like in our TV commercials) for a chance to win. Upload your photo or video before October 31st. Get your friends and family to vote for your entry. From this finalist pool of twelve, Mitsubishi will award a World VIP experience to the best photo entry and the best video entry. The ten runner-ups, don’t miss out though, with each receiving a $1,000 cash prize. So visit our website, upload your photo or video now and get your family and friends voting. Click here to find out for more details about this exclusive VIP World Tour experience. To read full Terms & Conditions click here. WHY ARE WE ASKING YOU TO POLISH YOUR CAR’S BADGE? At Mitsubishi we want to make cars that owners will love. To achieve this, we set the highest standards for every aspect of our cars – technology, styling, performance and safety and then back it with Australia’s Best New Car Warranty, Capped Price Servicing and Customer Care Programme – Mitsubishi Diamond Advantage. The act of polishing the badge is representative of the Mitsubishi owner’s pride of their vehicle and indicative of our desire to bring you a total Mitsubishi vehicle ownership experience. Visit our website for some examples of how polishing the badge on the front of the car is shown in our TV commercials by clicking HERE, but we want you to make your version as creative and individual to your Mitsubishi as you can.